Awarded under the GPO 951-M contract, this task order authorizes QAI to provide scanning, digitization and records management services to help OMHA preserve and manage paper files. Fulton, Md. 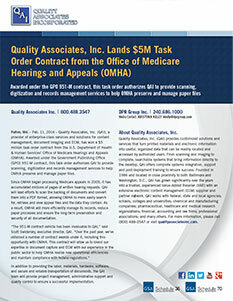 – Feb. 11, 2016 – Quality Associates, Inc. (QAI), a provider of enterprise-class services and solutions for content management, document imaging and ECM, has won a $5 million task order contract from the U.S. Department of Health & Human Services’ Office of Medicare Hearings and Appeals (OMHA). Awarded under the Government Publishing Office (GPO) 951-M contract, this task order authorizes QAI to provide scanning, digitization and records management services to help OMHA preserve and manage paper files. Since OMHA began processing Medicare appeals in 2005, it has accumulated millions of pages of written hearing requests. QAI will lead efforts to scan the backlog of documents and convert them into a PDF format, allowing OMHA to more easily search for, retrieve and view appeal files and the data they contain. As a result, OMHA will more efficiently manage its records, reduce paper processes and ensure the long-term preservation and security of all documentation. In addition to providing the labor, materials, hardware, software, and secure and reliable transportation of documents, the QAI team will provide project management, administrative support and quality control to ensure a successful implementation. Quality Associates, Inc. (QAI) provides customized solutions and services that turn printed materials and electronic information into useful, organized data that can be readily located and accessed by authorized users. From scanning and imaging to complete, searchable systems that bring information directly to the desktop, QAI offers complete systems integration, support and post-deployment training to ensure success. Founded in 1986 and located in close proximity to both Baltimore and Washington, D.C., QAI has grown significantly over the years into a trusted, experienced Value-Added Reseller (VAR) with an extensive electronic content management (ECM) supplier and partner network. QAI works with federal, state and local agencies; schools, colleges and universities; chemical and manufacturing companies; pharmaceutical, healthcare and medical research organizations; financial, accounting and law firms; professional associations; and many others. For more information, please call (800) 488-3547 or visit qualityassociatesinc.com.